This is the first time I have had a beer from the Basque region of Spain. 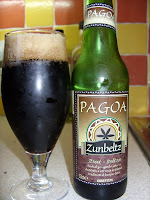 This Pagoa Zunbeltz is a stout no less. It is dark ruby with just a hint of light showing around the edges. It smells mild and chocolaty and reminds me a little of Murphy's except perhaps a little more bitter. It is also fairly carbonated and a little fizzy for a stout but that does not bother me. 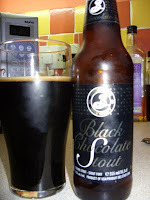 There are obvious hints of chocolate and coffee, it is almost like a Chocolate stout actually. It is a good stout, though nothing eye opening. Shame it comes in a small 330ml bottle and it is green as well. Also I can not find a website but the brewery is Euskal Garagardoa S.A.
Next up comes an Imperial stout I was advised to try from Brooklyn. The Black Chocolate stout is Black and smells like melted Dark Chocolate. It is very thick and Holy God the taste is unbelievable. There is a lot going on, too much to describe properly. I am pretty sure I get some wood (in the taste too). A very long deep sniff reminds me of Whiskey for some reason. I got the Winter 08-09 beer and it seems that the 07 when aged is a fantastic beer. I might have to get a few and keep them for a while. By the way, this is 10% so treat it with the respect it deserves. To sum this beer up, Go and get some.. in fact go and get a few bottles. Drink one and age the rest. I am afraid the next stout probably does not stand a chance after this one. Since I am writing this as I am tasting I will let you know when I finish the brooklyn. 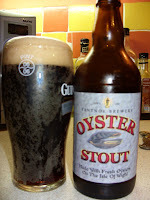 The last stout is from the Ventnor brewing company on the Isle of Wight. Unfortunately it seems they have been forced to close due to the recession and this makes me very sad. I am always sad to see a brewery close or any company for that matter. Anyway I tried their Oyster stout and it is the first beer of theirs I have tried and the first Oyster stout outside of the Porterhouse that I have had. After the Imperial stout, as expected I find this beer lacking in pretty much every area but that is my fault for grabbing the beer closest instead of thinking it through and leaving the imperial till last. This beer pours a dark ruby but plenty of light makes it through so it is not as dark as the other two. There is a good head and a very obvious malt aroma. The malt follows through in the mouth with a sour edge sneaking in. It seems a little thin but that might be just compared to the imperial. I can not say I taste any Oysters now but it is an interesting and enjoyable beer and seems light enough to enjoy in more volume than either of the first two beers, even though they were in 330ml bottles and this was 500ml. Also one last thing, I plan on making a kegerator soon. I picked up a fridge. You can follow my progress here. I am sure there will also be updates on the blog though. 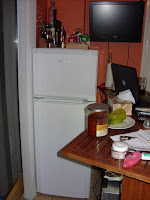 In the meantime, here re some pics of the fridge I I will be using. My two options are put the taps on the door of the fridge, or (and probably what I will do) run lines to the bar and put taps on the bar. I tried the Brooklyn Chocolate Stout recently and loved it too. Really chocolatey and lots going on with it. 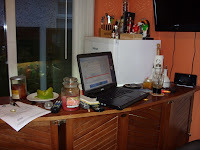 AS you said though tasting anything else after it is a bit difficult.